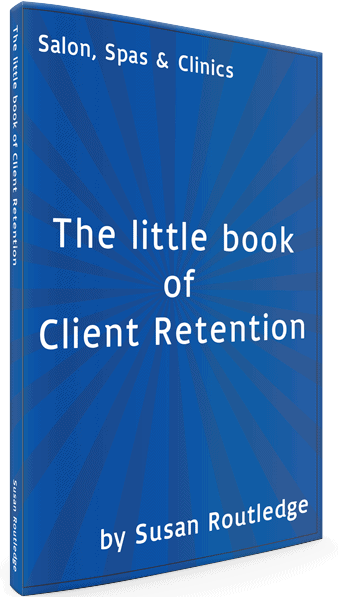 Have you got your copy of ‘The Little Book of Client Retention’ yet? Excellent, accurate record keeping is of course essential for insurance purposes and medical history, but it is also essential to keep momentum and credibility with your client. You should never have to ask a client details of her last treatment within your establishment, whether performed by yourself or another. Full details of past treatment and all recommendations should be recorded and your client should feel totally confident that she is in capable caring hands for both now and in the future. The simple rule is ‘If in doubt, DON’T DO IT. Clients can be very accomplished at trying to intimidate you into performing a treatment that you don’t feel is 100% suitable for them. Your gut instinct is always a good indicator, and if you have any doubts what so ever, then please firmly decline to offer treatment. The very same client will be far more intimidating if something goes wrong and returns, blaming you for your actions. Always stick to your professional morals, explaining fully why you are refusing to treat. Where possible offer an alternative safe treatment. A great way to increase retail sales and to keep clients loyal is to offer a 7-day money back guarantee on home-care products. It totally removes any risk in a client’s eyes and prevents the need to shop anywhere else. You may panic at the thought of this, but it shows a client so much confidence in how well you can prescribe skincare, and I can guarantee that if you are as professional and knowledgeable as you should be, then you will find that you will get an absolute minimum of products ever returned, if indeed ever. I find it so disrespectful when a regular client can be moved from one column to another without being asked or consulted within certain businesses to accommodate the business and not the client. Always re-iterate back to a client her appointment time, treatment and whom the appointment is with at the time of booking. That appointment should then be set in stone, unless there are extenuating circumstances and the client should be in full acknowledgement and approval given to any changes prior to the visit. Change without acknowledgement at your peril. New clients must have the same respect too as they may have noted who their appointment is with, and will feel totally undervalued instantly at their first, and possibly only, ever visit to you. A sure way to lose a client is if they cannot get in touch with you. If you are unable to answer the phone then make sure you have a personal message recorded apologizing for missing the call and a guarantee that you will return the call as soon as possible. Don’t be idle and use the standard pre recorded phone message, a client has telephoned to connect with your business and needs to hear your voice. Always ring back promptly. If you are missing regular calls then it will affect your client retention and it may be time to rethink reception cover or how you take calls. This book is in the format of quick Dos and Don’ts to ensure clients keep returning to you and love what you do.